Angel cards are similar to Tarot cards and are a wonderful tool for those needing guidance and seeking insights about their life. Our Angels send messages and support to us through the cards. You may need advice about your finances, your job, your relationship or you may simply be seeking peace of mind or reassurance about a certain situation. Having an Angel card reading can really help. There are a few differences between Angel Cards and Tarot Cards; one of the major differences is that the images on Angel cards are usually based on an angelic theme, whereas the images on Tarot Cards are more varied and are based on the traditional Major and Minor Arcana. Another difference is that Angel Cards are always used to show gentle and positive messages, rather than the specific times, dates or places that Tarot Cards can reveal. I feel they carry a “lighter energy” but are still very powerful and very useful. 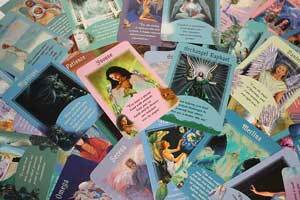 Readings are available online or face to face.